Marcus Rashford’s days at Manchester United have been nothing short of magical. Having started a fateful match where he wasn’t even supposed to feature, the youngster went on to cement his spot and make a firm mark on the Old Trafford crowd. In the seasons since, he has proven his worth time and again, and for a player still far from his years of prime, the lad has been handed several appearances, and most of them have been rendered fruitful. As a result, the 20-year-old forward has drawn comparisons with Wayne Rooney, a legend who started off his days at the Mancunian outfit as a youngster, and has since gone on to become their record goalscorer. 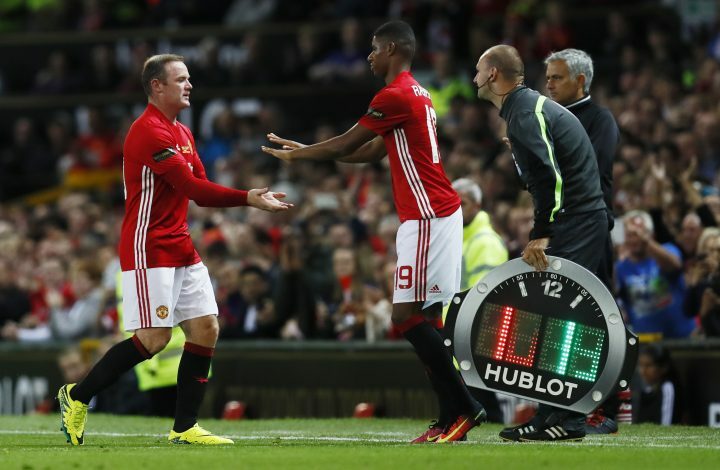 However, if Rashford wants to set his sights on a similar goal, then Rooney has some precious advice for the starlet, one which was handed over by Sir Alex Ferguson himself. Speaking to talkSPORT, the 32-year-old striker, who now plays for Everton, revealed: “Sometimes early on in my career I was working too hard tracking back and Alex Ferguson sat me down. Now, it appears that the same path is being advised to Rashford, who has already scored nine goals in all competitions this season and looks hungry for more. It’s certainly some great piece of advice to go by, and it will be important to see if Rashford follows it.